What is wrong with the armour in this photograph? Can you find what is wrong with this armour? The problem is strikingly obvious but most people don't even notice it. The correct answer is now being published to this page and can be found by scrolling further down. The most knowledgeable students of medieval armour should be able to identify the mistake. Clues can be found in the picture at left and other pictures in the series that help identify the anomaly. For those who want to see this photo full size along with the rest of the series, go to http://www.beautifuliron.com/hohensch.htm and click on the thumbnailed photos to enlarge them. Under reconstruction. Latest update 03 May 2005. This page to be updated in full soon. Helpful hints for solving this puzzle. To assist the reader in identifying the parts of medieval armours I have added an armour diagrams page with pictures and drawings that show the names of each of the parts of medieval armours. To see this page go to http://www.beautifuliron.com/armour_diagrams.htm. Still need more hints? Scroll further down this page. Museums make a tremendous effort to maintain accuracy. The professional staff of the museum is key to a good accurate display and also to the care and maintenance of ancient and antique artifacts. When a museum is very small, it often cannot afford a full-time curator and therefore must rely on periodic visits of curators from other institutions as the spending budget will allow. A small museum with no curator will try to care for and display their collections as best they can and try to follow the advice of previous visiting curators. But with no in-house curator and only an unskilled audience, small mistakes and problems often go unnoticed. This seldom causes any real harm to the collection, but an improperly displayed artifact may give visitors the wrong impression of how things of antiquity were used or what role they played in their era. Broken or deteriorating parts may present an overall confusing expression of how the artifacts would have looked or were used. The student of medieval armour must always be aware that the objects of 500 years ago will have deteriorated and often repaired on numerous occasions, and should expect that various pieces may have been mixed up from time to time. Likewise the suits of armour may be setup improperly or display poorly because the armour stand doesn't conform well to support the pieces in their proper places. Repairs of old were often incorrect. And even repairs done perfectly in years long past, may have deteriorated themselves just as the original work did before. Some repairs don't line up plates properly to give the viewer a proper impression of the original appearance of the armours. This can be remedied by photographing the parts and tracing each individual part. Then by carefully realigning the tracings and redrawing the parts, a view much closer to the original condition emerges. The drawing at right was made from tracings of the two photos of the leg defenses at left. By marking the rivets and then carefully pivoting each drawing at the rivet points and retracing, a more accurate view of what the leg defenses originally looked like, was found. I hope that this page serves as an example of why the student of armour cannot depend solely on any one source for learning, and instead must broaden his/her research and knowledge. Asking questions is a valuable learning tool. Most people are afraid to question someone who is considered the authority on a particular field. But just looking in museums won't open up many doors. Asking the experts questions which challenge the established facts or opinions, are a valuable method of learning more than just 'how' something is done, but also why it might have been done in that way. To see this series of photos full size, go to the Hohenschwangau Gothic armour page at http://www.beautifuliron.com/hohensch.htm and click on the thumbnailed pictures. The correct answer: the pauldrons are mounted backwards because they are on the wrong shoulders. The left swapped with the right, and the rear of the pauldrons are facing forward. Here is the evidence that supports my opinion of this armour. The gardbraces appear on the backs of the pauldrons instead of the front. 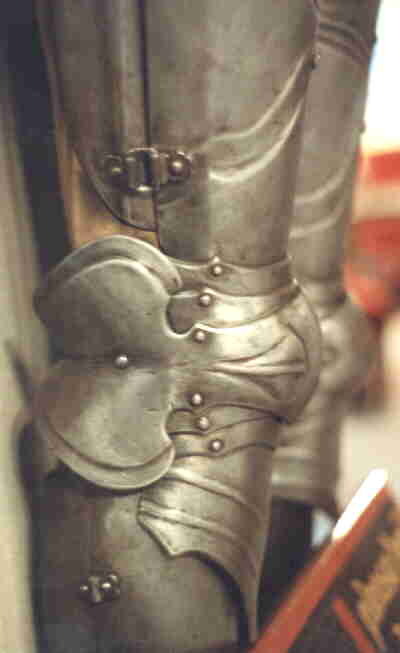 The rear edges of the gardbraces can be seen on the sides of the shoulder defenses of the Hohenschwangau armour- facing forward instead of backward! Lance rest mounted on the breastplate. A lance rest suggests the area under the shoulders should be cutout or relieved to allow the wearer to couch a lance under his arm. Look at the photos of the Hohenschwangau armour and see that there is no cutout area to allow the wearer to couch a lance. Large fan shaped defenses covering front of the shoulders. German style gothic armours employed less coverage of joints than the Italian armours. The large fan shaped defenses seen on the front shoulders of the Hohenschwangau armour as it is displayed in the photos above, would have been more commonly found on Milanese armours, not German armours. the large fan shaped defenses are normally found on the back of German armours, not the front. Clearly there is a problem with this armour. Numerous armour displays support my theory. At right are photos of a gothic armour made during the 'high gothic' period, exhibited in the Germanisches Museum in Nuremburg Germany. I chose this armour example because on this particular armour the bevor was attached to the front of the breastplate, and the short fauld and tuilles used on this armour are also helpful in explaining the reasons for why I judged a guess correct or incorrect. The gardbraces. Gardbraces are reinforcements worn over the outsides of the front of the pauldrons. Gardbraces are riveted or tied to the front of the center lamination of the pauldron so that they remain centered over the front of the pauldron and do not interfere with movement of the joint, while at the same time providing extra protection to the front of the joint against strikes by an opponent's lance or other weapon. In this series of photos we can see the area beneath the wearer's shoulder/arm is cutout in the front to allow for the lance to be couched under the arm. In the side view of the armour the rear edge of one of the gardbraces is visible running down the side of the shoulder defense and covering the articulated plates of the front of the pauldron. The rear edge of the gardbrace clearly facing rearward-not forward as seen on the Hohenschwangau armour photos. Lance rest. The lance rest supported the weight of the lance. To be able to use the lance rest, the wearer needed to be able to couch lance under his arm. A lance cannot be used if the armour prevents the lance from being held under the arm. A lance rest suggests that the armour was meant for use with a lance and from this we can expect to see the area under the right arm to be cut out or relieved. Bevor is too long for the armour? The armour was made for a short person while the bevor was made for a tall person? The helmet is too short? Helmet doesn't cover the back of the neck? The sword wouldn't be used for some reason (not pointy enough?)? Breastplate and back plate were on backwards? Pauldrons are too big for this armour? Pauldrons don't cover the tops of the shoulders? Other guesses were so baffling that I can't even determine what they were talking about. The Bevor. The bevor is too long for the armour? The armour was made for a short person while the bevor was made for a tall person? The helmet is too short? The helmet doesn't cover the back of the neck? A bevor used with a schalern (salad, salada, sallet) type helm during the gothic period is defined simply as a defense for the lower part of the face and throat. Many bevors were free-floating and secured only with a strap around the wearer's neck. Others such as the Hohenschwangau gothic armour and the high gothic armour seen in my photos from the Germanisches museum show a style of bevor that was snapped into a bracket on the top front of the breastplate in addition to the strap around the wearer's neck. The bracket into which the bevor snaps on the front of the breastplate is missing. 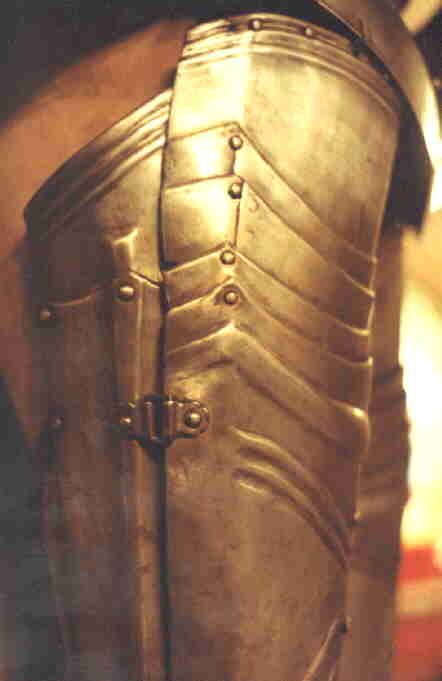 The rivet holes are plainly visible just above the top rivet joint of the breastplate placart. The bevor is propped up precariously on top of the breastplate about 4 inches above its normal position and tied to the armature that supports the armour. It is necessary to imagine what the armour would look like by rotating the bevor downward on the breastplate to line up inside the snap bracket, to be able to visualize what the armour would look like if the bevor was actually being worn by a man. The helmet is propped on top of the bevor in the current display and by lowering the bevor to the correct position, the helm would rest much closer to the shoulders. Since the bevor props up the helm by several inches, this would mean the helm will sit about 2 or 3 inches lower than the current position. Compare that with the pictures of the Germanisches armour. The oddly appearing length of the bevor is due entirely to the poor display, not any type of mistake. Gothic schalerns cover slightly below the tip of the wearer's nose and then sweep back and downward to converging in a point between the wearer's shoulder blades. The Hohenschwangau helmet is typical in size and shape of the style of the gothic period. The helmet would cover the back properly if it wasn't propped up precariously by the bevor. Couters. The couters are upside-down? The couters are too large? The seams of the couters overlap from top to bottom. This is seen in some of the pictures on the Hohenschwangau armour page. This seems correct to me. As for size, they are approximately the same as many other German made gothic armours. A little bit more pointed than the Germanisches armour, but similar in size. Sword. Sword isn't pointy enough to attack another knight? I have no idea how to answer this one. Tassets, fauld. Tassets are missing? Fauld is too short? Gothic armours didn't have tassets. In this case I am referring to the difference in the construction of the hip guard defenses that are sometimes fastened to the lower edge of the fauld. Tassets being more commonly made of multiple plates articulated together as opposed to the gothic tuille that was most often a single plate. The tuille was supposed to have taken the name of a style of shingle that it is said to resemble. The Hohenschwangau armour did not have tuilles. The use of tuilles would have required either points or belts and buckles riveted to the lower plate of the fauld. There are no rivet or tie-point holes in the lower edge of the fauld to suggest that tuilles were used. The length of the fauld appears similar to those of other German gothic armours. Compare the Hohenschwangau fauld with that of the Germanisches photos, the Hohenschwangau fauld is somewhat longer. Rerebraces. Rerebraces are on upside-down? Need help identifying the parts of an armour? See the Armour Diagrams page for descriptions of individual parts of armours at http://www.beautifuliron.com/armour_diagrams.htm. Also included is a dictionary of armour and description of where the parts go and what they do. Still under construction. At some point in time, somebody sets up this armour in a way which the medieval knight would not have done. We cannot fault a museum for having an armour stand that we consider less than desirable. Some museums cannot afford an armour stand which really shows off their armour in the most appealing way. However this is not a flaw in the armour. I am looking for a mistake or anomaly in this armour which the medieval knight would not have accepted if he were to wear this armour into combat. Look in any armour book and the reader will note the problems right away. No there is nothing wrong with the bevor on this armour. Anyone who doubts that should spend some time studying gothic armourers to note the several different ways the bevor was used with the armours. It can't be helped that the bevor is propped up under the helm in a way that doesn't show it off attractively. Look closely at the bottom of the bevor and top of the breastplate and see why the bevor had to be propped up like it is under the helm. This is not a mistake or anomaly I have asked about. The mistake so glaringly wrong with this armour is something a medieval knight would never do (or couldn't physically do) with the armour. Battle damage or storage damage doesn't count. Flip method. Try this method: print out the photo of the armour above, then print out a picture of a similar armour from a book or other source. They need to be similar armours but don't have to be the exact same armours. Attach the two photos together so that they lay with one picture directly on top of the other. Then flip back and forth through them quickly, looking at one and then the other for less than a second. The problem will jump out at the viewer. All photographs and drawings on this page are original by the author. Latest update 03 May, 2005. Originally published November 14th, 2000.